I hope you all had a good week. Things around here were quiet and I had a lot of time to think…and I thought about a lot of things. My mom, my life, my plans, my dreams. Have you ever had a week like that? My mind was going a mile a minute. I tried to concentrate on work and I did get a few things finished that had been hanging over my head. As a reward, I gave myself a day to make some new shop designs for spring. 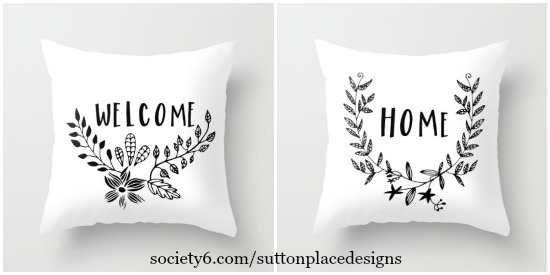 Fresh, simple black and white designs that go with any decor. Neutral yet not boring. (I hope. ha!) You can tell what I was thinking by the phrases that appeared on the designs. The theme is pretty clear. 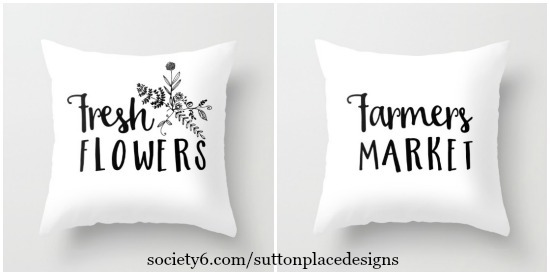 I threw in the black and white buffalo check just for fun…and the Bon Appetit designs are ones I have wanted to do for a few years. They would look darling in a dining room or kitchen. Spring can not come soon enough. We need to be finished with winter! In another week the days will be longer and with any luck a little bit warmer. Soon little green sprouts will appear in our gardens. The pansies will appear in the garden centers and I bet they find their way to my front porch. There is much to look forward to. These designs are also available as art prints and totes, as well as the pillow covers. 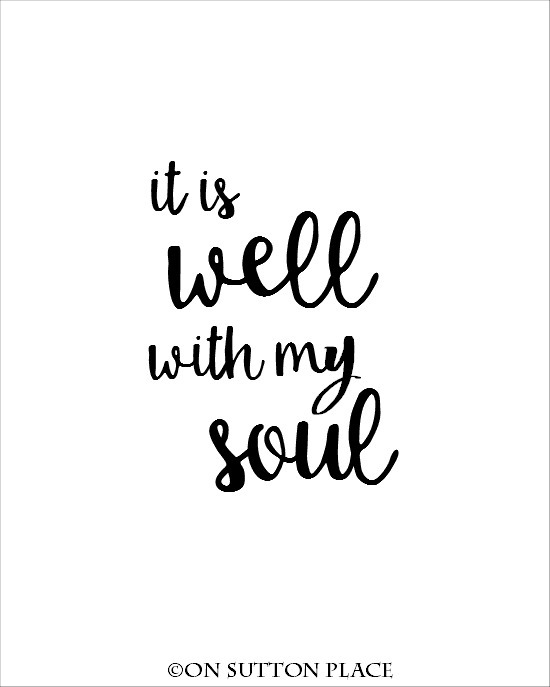 Click to download It Is Well With My Soul free printable. 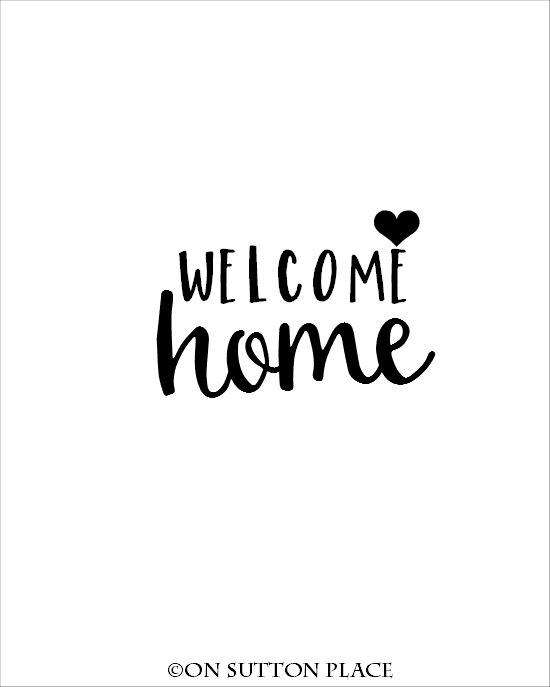 Click to download Welcome Home free printable. So sorry to hear of our loss, you are in the thoughts and prayers of many! Thank you.Some weeks are like that.Love your products,thanks for sharing.As weeks go by I hope you have more smiles for your mom than tears.Prayers for you & your family. I love the black and white, thank you for the printables. During Christmas I used black and white check print to mix in with a freshen up and loved it, and I got the idea from your Christmas poat with the red and black plaid. 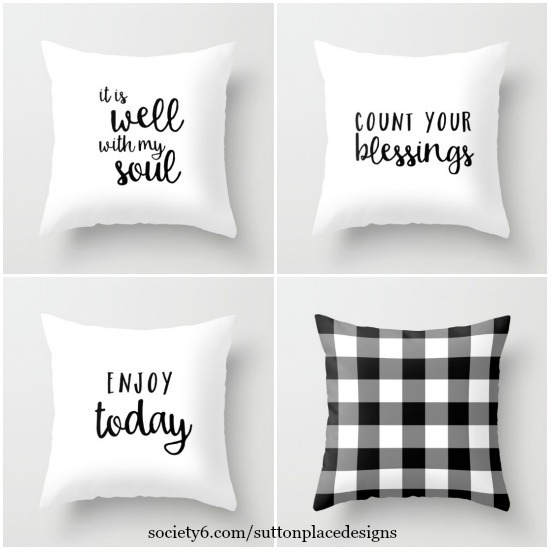 I could not ffind the red and black plaid ,but I found the black and white and was so excited..
Love the black plaid pillow. 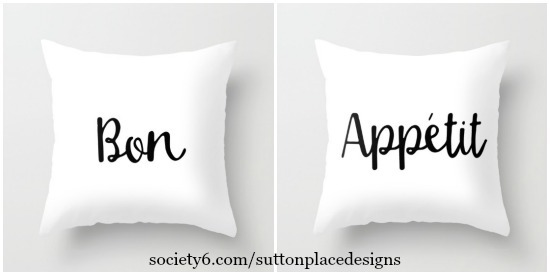 Where do you get your pillow forms? I have bought some from chain fabric stores and am not pleased with how they look (too hard and rigid). I’d like some good squishy ones but I want them to have some substance. Your work is always so appropriate!! I love these new prints and have the perfect black frames for them! Thanks for sharing your work in just a generous way! Ann, so good to hear from you. Grief is a complex emotion and we all must adjust in our own ways. Creative people often use that gift to moderate the feelings that can overwhelm us. You pillows are lovely. New pillows for many places in my home are on the agenda here. My front porch and yours are so much alike it is ironic. My doors are double but the general size is exactly the same. Even the rocking chairs. Your dog is a sweetie, mine is a black lab. I will take your ideas for Spring and work on the new pillows. Have a good week. Spring is upon us and that will put a new face on things. Creativity is both invigorating and soothing. Immersion in creative projects etc. can focus our thoughts on the process of whatever the project is. A successful completion to a project brings a kind of joy and satisfaction. Your “It is well with my soul” quote is touching.